We usually head for the Adirondack lakes further down the road but it's still in the foot hills, close to our home and very pretty especially at sunset. It's convenient for the locals nearby to group camp there so it can be a little busy and loud during the day if you don't get a more private site which there are plenty of. Those sites are large and wooded, most all paved (not always very level!) and if you don't get a water site you may still be able to drag your small boat and walk to the water bit there is a nice boat launch. It's convenient that the park supplys trash containers by the roadside of your site for recyclables and trash and also pick it up often. Since this river has many dams and is used for hydro power the water level can go up and down 2-3 feet from one day to the next. It didnt affect our kayaking fun, swimming or fishing and was intriguing. I came across the largest and most beautiful sounding loon early in the morning…perfect before we had to pack it up and leave. 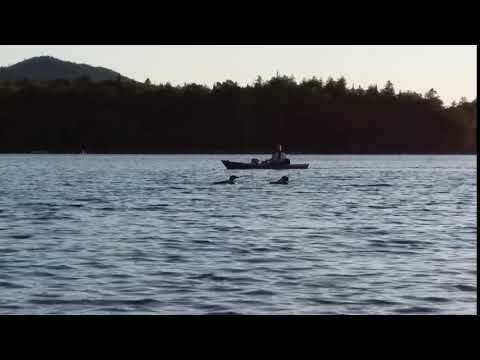 Will post a video of the loon calling another along with pictures. Turn up the volume. Serene and quiet. We did some nice kayaking. Hung out with a pair of beautifully sounding Loons at sunset. Just one mile out of Beautiful Lake Eaton State park is the most quaint and rustic Adirondack village of Long Lake. It will suit all of your camping needs. This family friendly park and scenery was a beautiful background to watch my grandkids play in the water for hours while we hung out with the ducks on the beach. There was a really fun ranger activity they earned badges from. We all left very happy campers but sad to leave the mountains. Definitely hope to return every year.